Cold-rolled mezzanines are a great way to take advantage of all the space a building has to offer. Steel mezzanines are not only cost-effective, they are fully customizable. This makes them a cheaper solution than a typical expansion. As the company evolves, their mezzanine can as well. Even free standing mezzanines take advantage of a modular structure. This means that pieces can be added, moved or taken away completely with very little effort. As an investment, mezzanines are very practical. Affordability plays a huge roll in choosing a mezzanine. Much like a building expansion, it takes a little money in order to get the project going. Business owners shouldn’t work with a company that only offers cheap mezzanines, they need to work with a company that is going to meet their pricing needs and produce good, high-quality mezzanines. Cold-rolled mezzanines available online will vary in price. There are many different ways to customize and expand the mezzanine, so the final price really depends on what the company wants done. 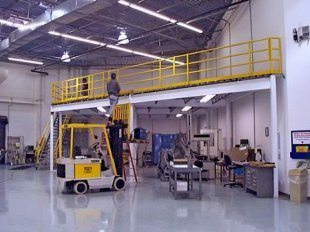 Considering that the mezzanine system can be changed at any time, companies may want to consider installing a basic system and then adding on to it as they expand their operations. Companies that sell steel mezzanines online will be happy to show you popular mezzanine designs. Getting the best modular mezzanines for sale starts with working with a company that is willing to meet your expectations. You need a production company that is flexible and able to show you practical designs that can increase your productivity. Custom designs also need to be fitted for your space. Some design teams may never ask you about the space you are trying to fill. Warehouses, factories and office buildings all have different needs when it comes to space. Working with a company like Panel Built will help you find ways to improve the specific space you have. Mezzanines by Panel Built are designed to help you create the highly effective work environment you always wanted. Should You Invest in a Free Standing Mezzanine? Free standing mezzanines can be a great addition to any property. They offer a lot in terms of portability, especially since they don’t rely on walls. Companies that sell steel mezzanines online will often talk about the benefits of a free standing structure, but they may not offer the best construction methods or options. Panel Built works with companies to help them determine if a free standing mezzanine is the best solution for them. 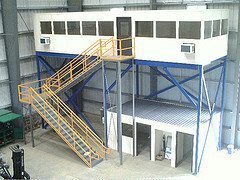 Deciding to invest in free standing prefabricated mezzanines can help any business expand quickly. While other structural mezzanines may be great for overseeing production or housing additional storage space, there are more possibilities with a free standing model. Offices, for example, can be stacked on top of each other away from noisy production areas. Choosing the right mezzanines by Panel Built will help you have better control over your space. You won’t have to put offices or storage spaces on the ground floor. Being able to easily build up will help you take full control over your facility and make it better suit your needs. Panel Built mezzanines are made with very durable materials. By creating high quality products, Panel Built has helped many companies expand their space. Prefabricated steel mezzanines need to be able to stand strong, even when put under pressure. No one wants to be carrying heavy furniture or boxes and feel the structure beneath them wobble! Reinforcing the structure with the best available materials helps your facility improve safety. Panel Built also strives to make office mezzanines that can withstand the tests of time. They use materials that have been treated to resist common forms of damage. Not only will they withstand some weather if placed outdoors, the mezzanines are also resistant to rust and water damage. This makes them a longer lasting investment. Mezzanines are perfect for creating multi-purpose spaces that can be rearranged as needed. Most businesses need a flexible space that can house conference rooms, offices or storage without interfering with production. Careful planning allows companies to create a system that really works for them on a long term basis. Because there are multiple structures available, there are countless designs that a company can take advantage of. Panel Built works to match any interior designs that a company wants, so the mezzanine can easily flow with the rest of a building’s layout. Exteriors for rooms can be created with a number of different materials. Businesses can get a practical design or use their mezzanine to create office spaces that look like miniature houses. When trying to find custom mezzanines online, it is important to work with a company that has plenty of experience. Panel Built has years of experience creating prefabricated steel mezzanines for factories, warehouses, offices and businesses. Mezzanines by Panel Built help you get exactly what you want, reducing down time. The company will work quickly to produce a quality design that you can be proud to show off. If you are looking for cold-rolled mezzanines available online, contact Panel Built today. You will be surprised by the outstanding quality of work and number of references they have available.